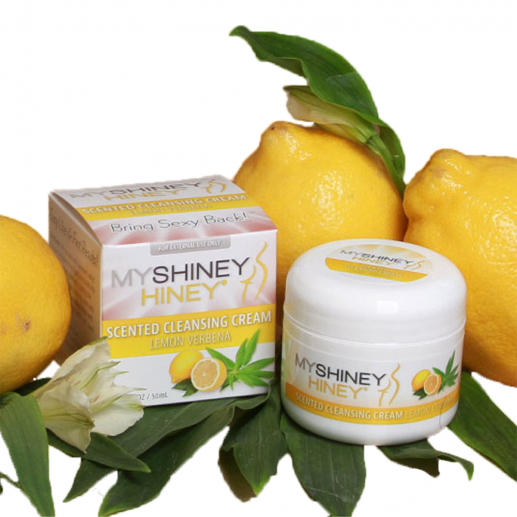 My Shiney Hiney Cleansing Creams ive your rear a well-deserved treat with the My Shiney Hiney Cleansing Cream. The My Shiney Hiney Cleansing Cream removes odors and impurities while also conditioning skin with moisture from its rich enriching formula. Key Product Features: Helps skin retain moisture Reduces inflammation Gives skin a soft and smooth appearance Gently cleanses while conditioning skin Long lasting fragrance The ingredients used in My Shiney Hiney Cleansing Creams meet or exceed all cosmetic quality standards, including those of the US Food &Drug Administration (FDA). Directions: Wet the area with lukewarm water. Dip your My Shiney Hiney Applicator Brush into the cleansing cream, thoroughly coating the applicator bristles. Brush cleansing cream onto skin with a gentle, circular motion. Rinse.